Fat LossBioTech Brutal Blade - 120 kaps. It is the strongest and most effective fat burner on the market. Developed by nutritionists and sports physiologists fat burner "brutal" fights fat! Ideally strong team for maximum weight reduction. BioTech Brutal Blade is the strongest and most effective fat burner on the market. Developed by nutritionists and sports physiologists fat burner "brutal" fights fat! Ideally strong team for maximum weight reduction. It stimulates the body to burn fat even while resting! The strong effect of burning fat for hard-training athletes and bodybuilders. Brutal Blade - a description and characteristics of a strong American fat burner. Brutal Blade is an excellent supplement to the series of brutal Nutrition BioTech USA brand. Why is the best fat burner on the market? Because in one tablet Brutal Blade are the most effective ingredients in sufficiently high doses. With the latest achievements and unique herbal ingredients has created the perfect fat burner. Cheap thermogenic Brutal Blade burns fat not only during hard training, but also when not training. All active substances burning fat, as well as other effective substances support the process of fat reduction are contained in one capsule supplement. 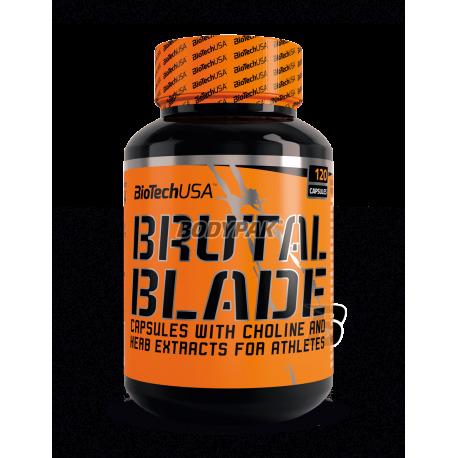 Brutal Blade contains thermogenic ingredients that speed up metabolism and increase body temperature and, therefore, the body consumes more energy than usual. Fat burner Series Brutal Blade also contains ingredients to improve memory and concentration. 2-3 caps. In the morning on an empty stomach, 2-3 caps. 30 minutes before workout. Other Ingredients: capsule shell (gelatin, purified water, dyes (titanium dioxide, cochineal), anti-caking agent (magnesium stearate, silicon dioxide). Skład jest bogaty w naturalne substancje to bardzo mi się podoba. czy działa - tak, czy to cudowne kapsułki - nie..
Nie jest źle, nie jest zajebiście.. po prostu solidny produkt. Dobry spalacz, faktycznie nie powoduje zjazdu co jest zaletą.